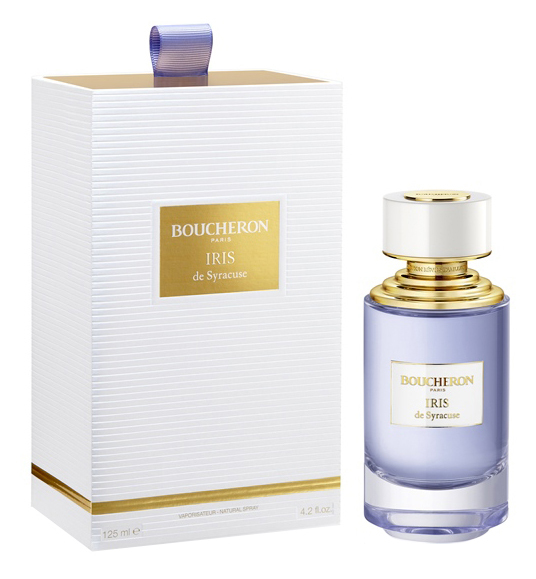 Iris de Syracuse is a popular perfume by Boucheron for women and men and was released in 2017. The scent is floral-powdery. It is being marketed by Inter Parfums. My experience with Iris de Syracuse seems to reflect that of Littlegrassstraw. The opening is ever so lovely: a tenderly sweet woody iris, with a bit of starchy yet creamy, velvety texture. I don't perceive any earthy, metallic, carroty aspects of the iris. Iris de Syracuse at this stage, embodies the olfactory equivalent of an elegant pastel purple velvet gown. Unfortunately, once it starts to dry down after roughly 2 hours, its magic begins to wear off. A sweet ambery accord pervades the creamy iris, turning it into a candy iris with a tiny suggestion of lipstick, which reminds me of a less ambery dry down of Jacques Fath Bel Ambre. It's still lovely, but in comparison to the graceful opening, it feels rather generic and déjà-vu. The sillage is mostly close to the skin, and the longevity is around 8 hours. I thoroughly enjoyed Iris de Syracuse, especially that its velvety sweet woody iris opening imparts a sophisticated yet approachable elegance. The transition to the candy ambery iris is also quite subtle, making it mostly linear, easy to appreciate and versatile as well. However, because of the intense competition of many great iris fragrances, Iris de Syracuse, as lovely as it is, ultimately feels lack in personality and identity, a problem that impacts the whole range of Boucheron La Collection. Personally, I think there are other iris fragrances able to fulfilling a similar function as Iris de Syracuse, and with more personality and creativity as well. The high price and limited availability of Iris de Syracuse also don't help. All in all, if you love iris and would like to get hands on each and every one possible, or if you happen to be on a quest for slightly starchy and creamy sweet iris, Iris de Syracuse would be quite enjoyable to sample, even though I suspect that there are better and more affordable alternatives somewhere else. Write the first Review for Iris de Syracuse!